In a world of fat-free, sugar-free, gluten-free, GMO-free and organic foods, we do our best as a family to eat healthy most of the time, but everyone needs to indulge once in awhile! In my family, our favorite guilty pleasure is deep fried food! Nothing is better than fresh cut fries in a deep fryer. But, making homemade deep fried food is not worth the aggravation of the clean-up most of the time. 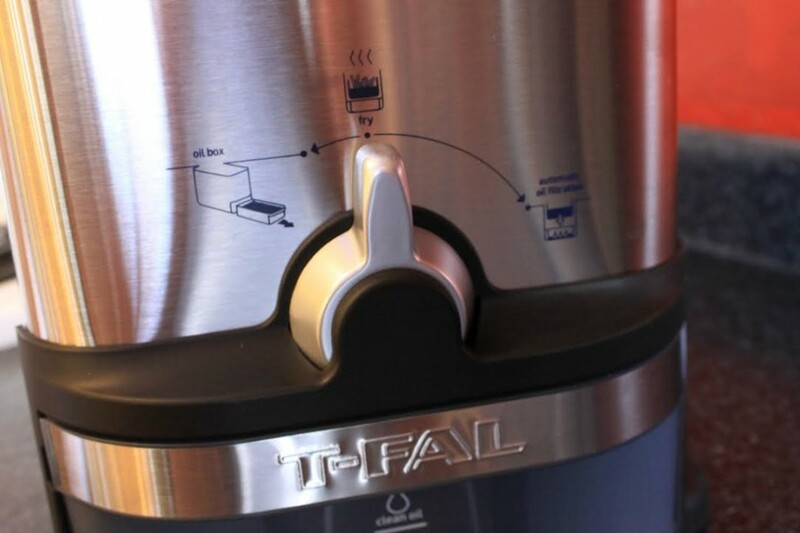 Or at least that’s what I always thought…and then I was given the opportunity to review T-Fal’s EZ-Clean Deep Fryer! What a genius creation! You never have to touch the oil. So it really is no muss-no fuss deep frying! On the front of the deep fryer there are 3 settings. On the oil box setting, it allows you to slide out the oil box for storage or cleaning. 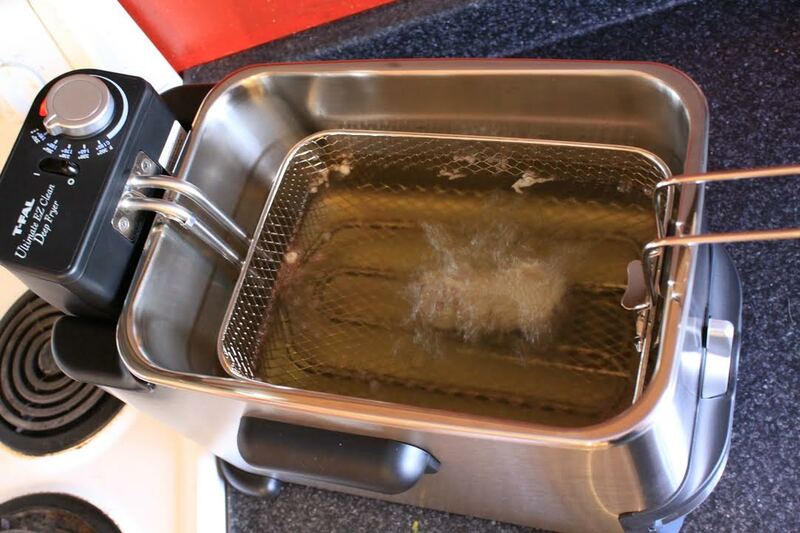 The fry setting is the setting you use to cook, and what makes this deep fryer so unique is the automatic oil filtration setting – this setting drains the oil from the deep fryer into the oil box below for quick and easy cleaning and storage! This oil box is also designed of a material that helps to ensure that the oil doesn’t go rancid in between uses! My favorite deep fryer recipe originates from Scotland and is the perfect indulgent dessert! 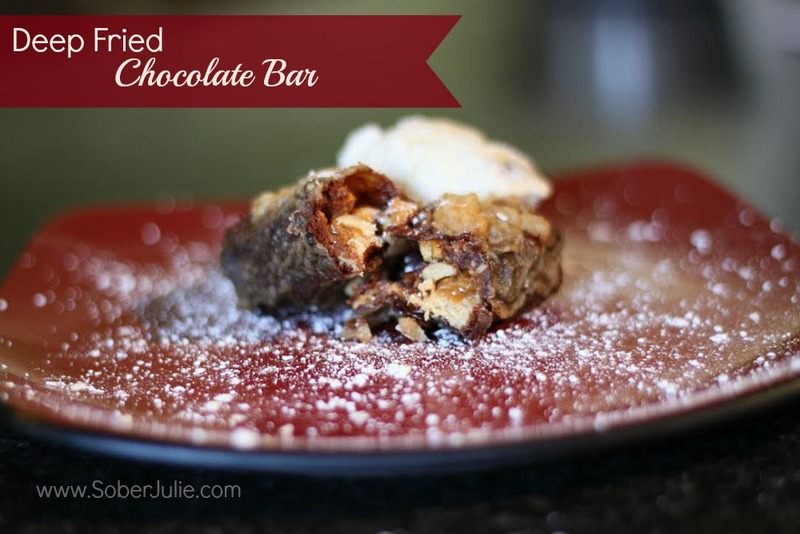 Deep Fried Chocolate Bars. 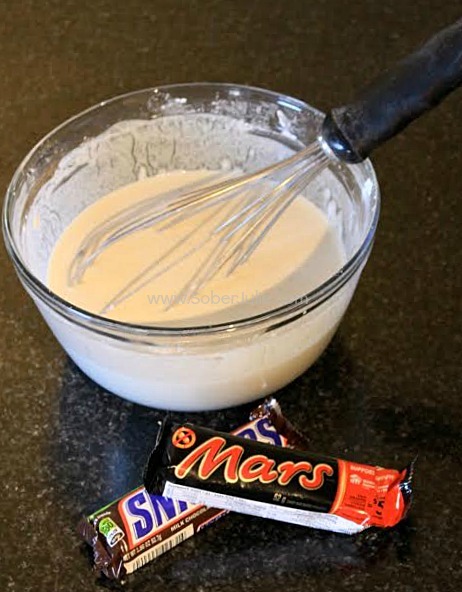 Many of the recipes that I have seen for this call for Mars Bars, but I have updated the recipe to use Snickers Bars. Place the flour, corn starch, baking powder and salt into a bowl and slowly add the water while whisking. To whip up a good batter, the key is to take your time adding the water so the batter doesn’t get too runny. It should be about the consistency of pancake batter – thick enough to coat the chocolate bars. Preheat your deep fryer to 375 degrees. Coat the chocolate bars in the batter and drop into the hot fryer oil. Let the chocolate bars cook in the oil until golden brown (about 5-7 minutes). Remove from fryer and blot remaining oil off on paper towels. Allow to cool and then serve with ice cream and powdered sugar. Mmmmm-mmmmm good! What I like the most about this deep fryer is the easy clean up. With the oil filtration system, you can drain the oil, dismantle the machine and pop all the pieces into the dishwasher! The fryer is also family size, so I can make enough fresh cut fries in one shot to feed the whole family and yet it is compact enough that I can store it easily in a cupboard until my next use. The heating controls give you lots of range to choose the best temperature and the oil heats up quite quickly! My final thoughts about this fryer: My husband will be begging me to deep fry everything now that I have finally found a fryer that is this easy to use and clean! Disclosure: I was provided product for this review, all opinions are my own. Nice that it’s easy to clean. I always said that I wouldn’t own a deepfryer because it was so unhealthy, and if we were going to eat unhealthy it had to be “special”. Just for when we go out to eat. I now have a deepfryer. A present from my husband whose favourite food is sweet potato fries. I’ve set a rule for once a month so it’s still a treat.